What makes a great telemetry application? One that helps you go faster without requiring a PhD in physics. 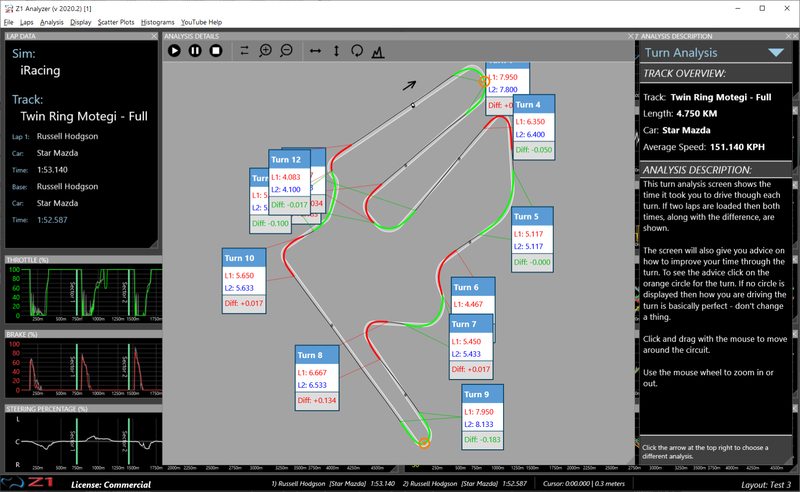 That is exactly what the Z1 Analyzer does with the new Lap Analysis section. You'll a description of your lap in plain English along with a comparison to any other loaded lap. 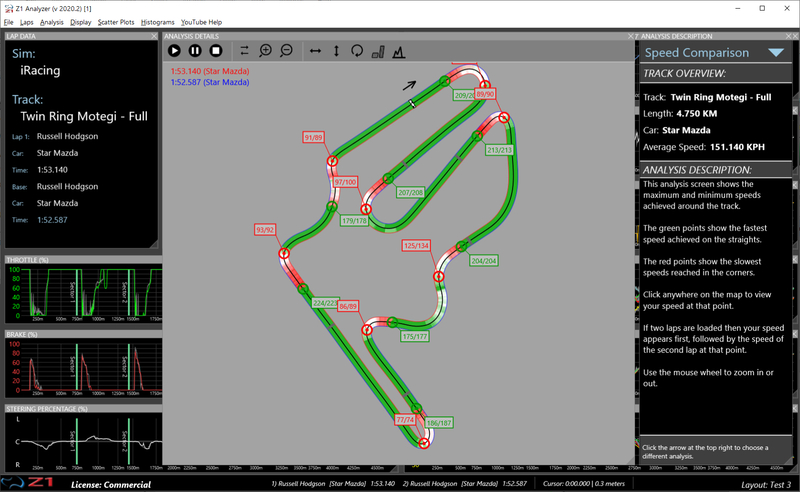 Clicking the arrow at the bottom right of the track map will open the lap analysis section. 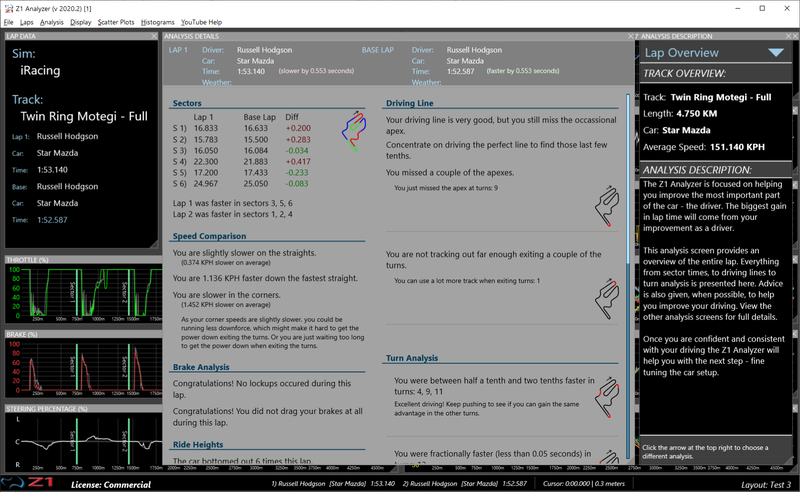 The Lap Overview section is the starting point of the analysis section. It gives you an overview of your lap in English. It includes paragraphs on your sectors, driving line, turns analysis, speed, brake lockups and ride heights. Once you've read this section, you can view more details by selecting a new section from the drop down menu at the top right of the screen. This analysis show the top speed you reach at the end of straights, and the slowest speeds you reach in the turns. If you have a second lap loaded you will also see the speeds that the car from the other lap is doing at the same point on the track. This lets you easily see where you are faster or slower. This analysis shows you your driving line around the track. And it isn't just a line floating in space. It also allows you to see the edges of the track. This is vital as you can then see if you are using all of the track. In addition sectors are marked along with the times taken in each one. 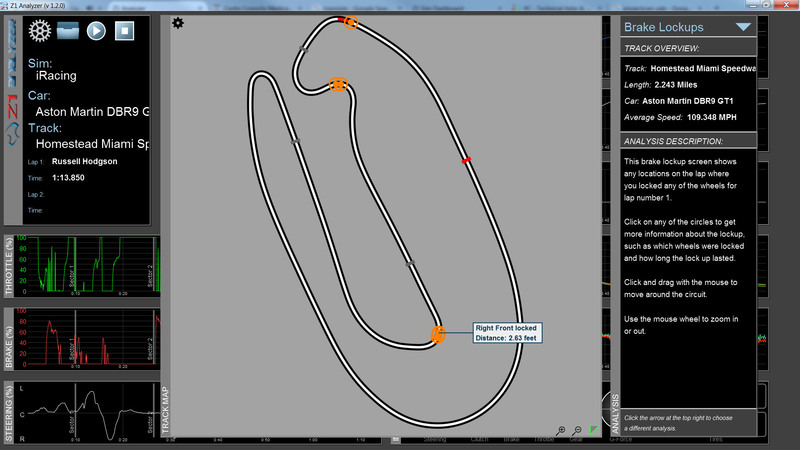 If two laps are loaded then both driving lines are shown, allowing you to compare them. This analysis shows you the turns in detail. Just as with the driving line you can see the full extent of the track with your driving line overlaid. The Z1 Analyzer will then focus on each turn, telling you how long it took to negotiate each one. 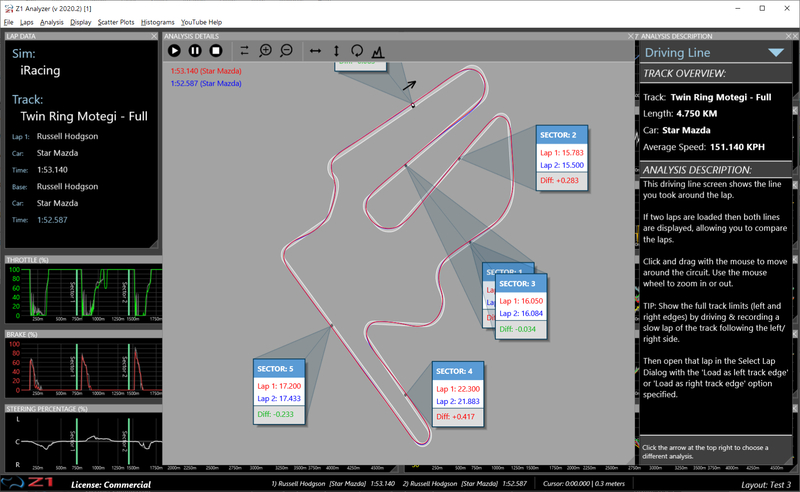 If two laps are loaded then the difference in time is also displayed. Finally if the Z1 Analyzer has advice for you on how to improve the turn you will see an orange circle. Click that circle to see the advice. This analysis screen shows you any brake lockups that may have happened during the lap. If you see an orange circle, that means you locked one or more wheels at that point. Click on it to see the details of the lockup. 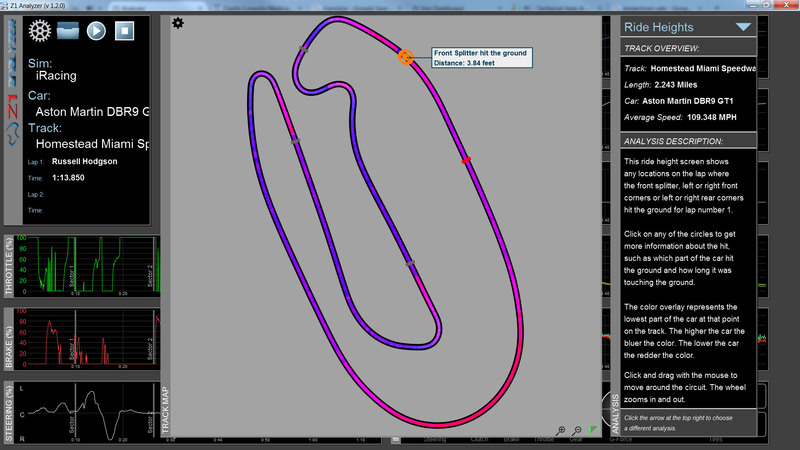 This analysis screen shows you the ride heights of the car as you progress round the lap. A color overlay going from blue (for most ground clearance) to red (for least ground clearance) is displayed. If any part of the car hit the track at any point you will see an orange circle. Click on that circle to see more details.